This name derives from the Aramaic “tūmā”, (Hebrew: te'oma), (Ancient Greek: Thōmâs “θωμᾶσ”), meaning “twin, double, (astrology) Gemini”. The given name of Thomas the apostle was Yehuda (Jude, Judas). 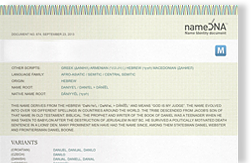 In fact is not in origin a given name but an epithet of a New Testament figure. In the New Testament, the designation was applied to “Judas Thomas”, the second Judas of the apostles (hence his appellation "twin"). Use as a given name originates in the early middle ages. The name becomes more common during the Middle Ages, with notable bearers including: Thomas the Presbyter (7th century) and Thomas the Slav (8th century).